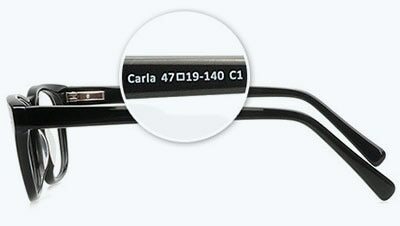 Finding the ideal eyeglass frame size is super important when buying glasses online. But did you know it's also super-simple? We created our Frame Measurement Guide to make finding your personal fit an easy and quick process. Come discover what you need to know to measure your frames. To ensure your frames fit perfectly, first determine which size frames are best for you. The best place to start is with the measurements on a pair you already own. First, search for the three little numbers on the inside of the temple of your glasses. Some may also refer to this section as the "arm" of your glasses. These three numbers are the frame's measurements. Sometimes a fourth number will be noted on the arms, which is your lens height. Keep in mind that all of these measurements are in millimeters. This is the horizontal width of each lens at its widest point. It typically ranges from 40mm to 60mm. This is the distance between your two lenses. In short, the bridge width is the space where your frames fit against your nose. The size of this piece ranges from 14mm to 24mm. 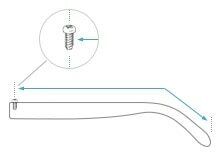 This is the length of the temple from each screw to its temple tip, including the bend that sits on your ear. The temple is typically 120mm to 150mm long. This is the vertical height of your eyeglass lenses at the widest point of the lens within the frame. 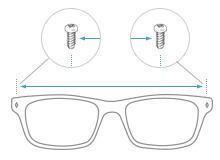 The lens height is important when measuring bifocals or progressive lenses. A frame that is too narrow will make your face look wider, while a frame that is too wide will make your face look narrower. This is one of the most important factors in finding a pair of glasses that fits well. Find a frame that is slightly wider than your face — no more than a finger width between the temple and your face. Any wider is a sign your frames are too wide. This measurement is not printed on the temple of your glasses. To find it, take your measuring tape and measure horizontally across the front of your frames, including any hinges or design features that stick out on the sides. Temple length is the measurement in millimeters of the “arms” of the frame. This measurement does not vary as much as the others. 135mm, 140mm, 145mm, and 150mm are the most common options. The temple should fit horizontally and evenly along your face and fit comfortably along the outside of your ear. To determine which lens size is right for you, know that a small lens width is 50mm or less, medium is between 51mm and 54mm and large is any lens wider than 55mm. Your eyes should be centered within your lenses. Eyeglass frames that are too wide will make your eyes appear too close together, while narrow frames will give your eyes a wide-set look. The distance between two lenses equals a frame's bridge width. The bridge should sit comfortably flush against your nose. If you have close-set eyes or want a narrow bridge, this number should be lower. If you have wide-set eyes or want a wide bridge, this number should be higher. The location of your nose can help determine which frame style works best for you. If your nose is higher on your face, an eyeglass style where the bridge is even with the frame’s brow line will look best. If your nose is situated a bit lower on your face, a frame with a lower bridge and curved brow line will better suit your features. Discover which eyeglass frames look best on you by checking out our full collection of prescription frames for men, women and children. At EyeBuyDirect, we offer a 14-day fit and style guarantee to ensure you find the perfect frames and a 12-month guarantee on all of our products.